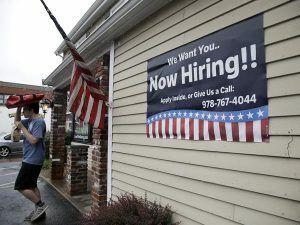 Job growth in the U.S. remained steady during July, though workers have continued to see slower increases in wages, showed data released by the U.S. Department of Labor on Friday. The jobs report showed an increase in new jobs of 209,000, which was slightly above expectations by analysts. The country’s unemployment rate fell slightly from June’s 4.4% to 4.3% during July matching a low of 16 years in May. The hourly earnings on average increased 9 cents equal to 1% to end July at $26.36. With jobs figures slightly above analyst expectations and wages talking a lateral move, one economist called the report business as usual. There remains a demand for U.S. labor, said the analysts, but it remains lukewarm related to wages. Analysts called the report positive but noted the labor market continued its improvement. One Wall Street analyst said that while the jobs creation paces in 2017 might not have the same strength as the prior year, it is still good for mature economic expansion. President Donald Trump trumpeted the new jobs numbers through a tweet. He called the figures excellent. Analyst said gains in jobs show that employers were for the most part still optimistic related to the economy. Spending by consumers and businesses is efficient but not robust and thus far the economy and the financial markets continue to perform despite noise generated in the background on Capitol Hill. Job growth for June was revised up 9,000, while numbers from May were given a downward revision of 7,000. The business and professional, food and beverage and healthcare services sectors all experienced gains in July. Thus far in 2017, job growth overall has averaged approximately 184,000 each month, in comparison with a growth rate for all of 2016 per month of 187,000. Job growth across the food and beverage services segment, which added new jobs in the amount of 53,000 during July, and have thus far in 2017 added 313,000, is notable since it shows further change in the spending habits of consumers. While the consumers have made cut backs in spending at the traditional brick and mortar locations, they have become more interested in eating out, which affects the broader labor market, a chief economist said. Transportation and warehousing jobs were up during July, likely helped by the rise in sales for e-commerce. The hourly wage has increased 2.5% during the same period last year. But economists said the gains were not as high as expected when they are paired with a low rate of employment.